Lovely graphics, lovely music, and great effects! Recycling is good for environment + what Mystra said. Some really nice text in here, I liked the nod to Crystal Dream 2 in the scroller as well. Amazing. Me loved the oldskool flavor. Thumbs up. OMG! This is sooo beautiful it always bring tears to my eyes! MOOAR! Incredibly uninspired+recycled object show. I totally <3 the chiptune though. The effects were a tad too oldschool for my taste. 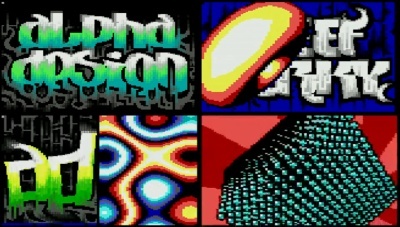 The ANSI logos were ace though. Seriously, too much recycling here. looking back at their TMDC entries.. um, yes, a lot of it is recycled. well, half a thumb up, anyway. some recycled scenes, but pure oldskool love and nice music. Great solid-looking objects and tune. Nice ANSI, but didn't really care for the rest. I find it funny that some people started clapping at the sight of the torus. Oldish effects in a boring way. maybe oldish. yep. But it's neat, and fun to see it in textmode-windows. The music is pretty nice. No, productions that are 64k belong in the 64k. It doens't matter if they are flash, "textmode," or "horse." Anyway. Again it's good to see Ansi in 'textmode' demos. Well, good, but nothing we haven't seen before. I mean, the friggin wikipedia page for the whole demoscene contains almost the same screenshot! Thus piggy. Didn't like the music, otherwise pretty solid. Scan the file for yourself. If you do not trust it. "Solid" is the right word. I like the anti-aliasing but the rest really is so-so. not very good, not bad. oink! Really awersome music, great work for ANSI, great engine.